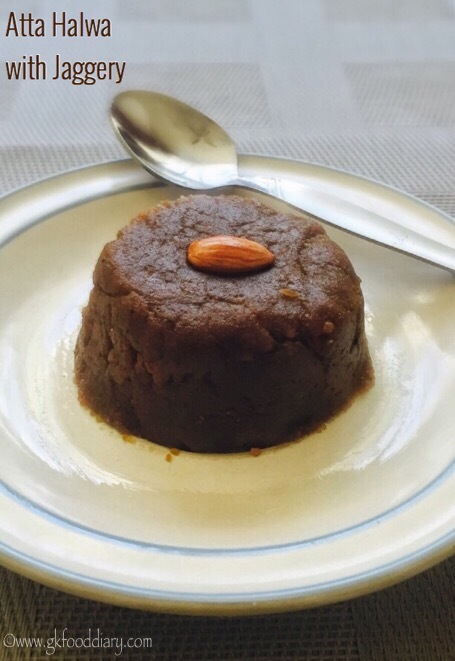 Easy Atta Halwa/Wheat flour halwa with jaggery – yummy dessert made with whole wheat flour, ghee, jaggery syrup and nuts for toddlers, kids and for the whole family. 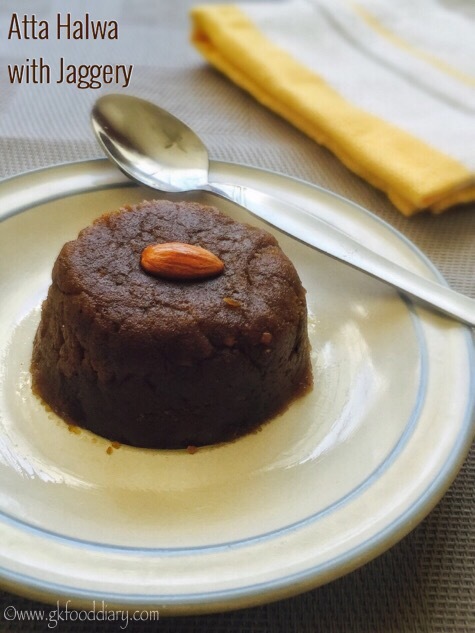 This whole wheat halwa is a very delicious healthy halwa with the goodness of jaggery and can be given to toddlers after one year. The recipe is so simple with less ingredients and takes only 30 mins altogether. 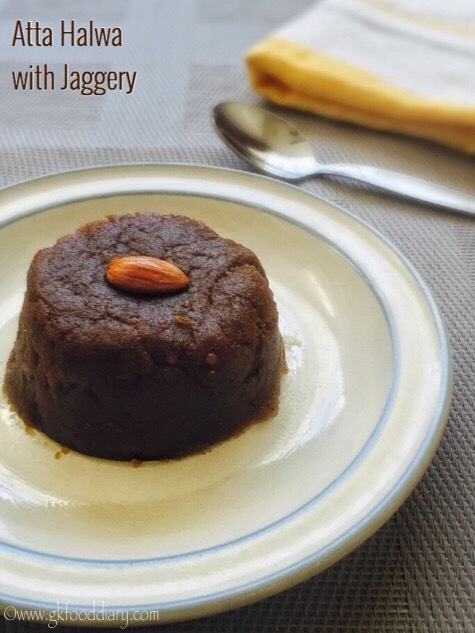 I have used the homemade jaggery syrup which I shared in my previous post, even jaggery powder works fine. But belive me, the taste of this halwa is no lesser than the ones made with sugar. Check the similar recipe of whole wheat halwa with apples for babies here. Now Let’s check how to make this easy atta halwa recipe for toddlers and kids. Measure jaggery,ghee and wheat flour. 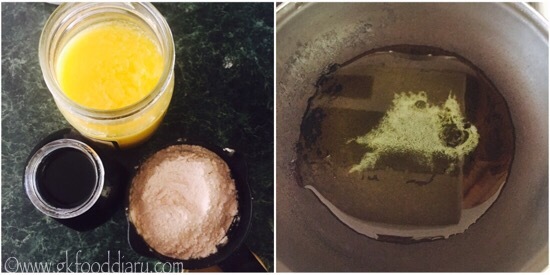 If using jaggery powder, heat the jaggery powder with ¼ cup of water in a saucepan until it melts completely. Switch off the flame once done and set aside. In a thick bottomed pan, heat and melt ghee. Add in the wheat flour and roast it in low medium flame for 10 minutes until golden brown and nice aroma comes. Once the wheat flour is roasted well, add water. stir it quickly. Keep stirring it continuously until the water is completely absorbed and it comes altogether. It may take 3-5 minutes in low flame. 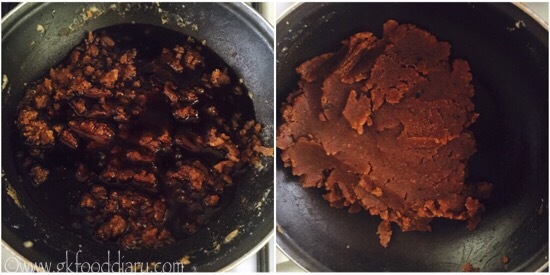 Then add jaggery water or syrup,now the halwa starts liquidized. Keep stirring continuously. When the halwa forms a whole mass and doesn't stick to the pan, add ghee fried cashews or almonds if desired. Switch off the flame once done. It hardly takes only 2-3 minutes after adding jaggery. 1. Measure jaggery,ghee and wheat flour. 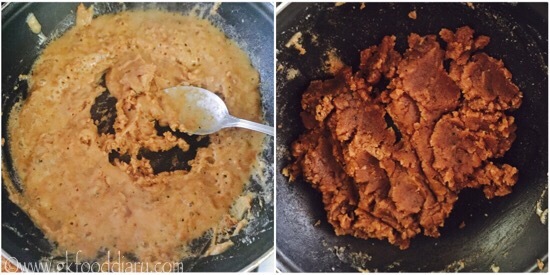 If using jaggery powder, heat the jaggery powder with 1/4 cup of water in a saucepan until it melts completely. Switch off the flame once done and set aside. In a thick bottomed pan, Heat and melt ghee. 2.Add in the wheat flour and roast it in low medium flame for 10 minutes until golden brown and nice aroma comes. 3. 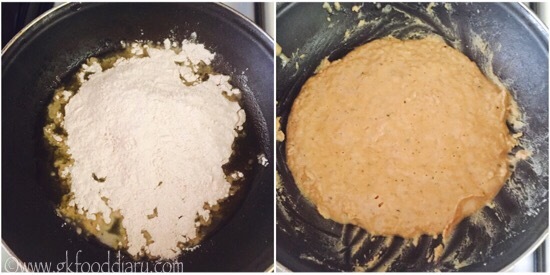 Once the wheat flour is roasted well, add water. stir it quickly. Keep stirring it continuously until the water is completely absorbed and it comes altogether. It may take 3-5 minutes in low flame. 4. Then add jaggery water or syrup,now the halwa starts liquidized. Keep stirring continuously. When the halwa forms a whole mass and doesn’t stick to the pan, add ghee fried cashews or almonds if desired. Switch off the flame once done. It hardly takes only 2-3 minutes after adding jaggery. Delicious atta halwa is ready ! Jaggery syrup or jaggery water should be runny and make sure its not too thick. Do the whole process in low medium flame or low flame in order to avoid burning in the bottom. Make sure to roast the wheat flour well otherwise the halwa may have raw smell. You can replace jaggery with same amount of sugar. Don’t prefer whole nuts for small babies, instead add powdered nuts.